WELL, Mrs. Warren, I cannot see that you have any particular cause for uneasiness, nor do I understand why I, whose time is of some value, should interfere in the matter. 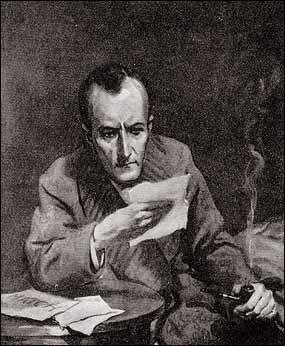 I really have other things to engage me. So spoke Sherlock Holmes and turned back to the great scrapbook in which he was arranging and indexing some of his recent material. Well, I think we must wait for a little more material. After all, you have nothing to complain of. 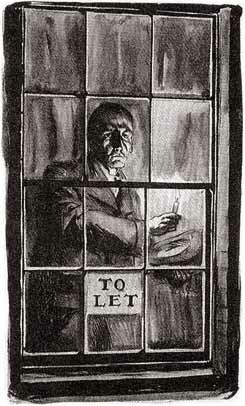 You have received your rent, and he is not a troublesome lodger, though he is certainly an unusual one. He pays you well, and if he chooses to lie concealed it is no direct business of yours. We have no excuse for an intrusion upon his privacy until we have some reason to think that there is a guilty reason for it. Ive taken up the matter, and I wont lose sight of it. Report to me if anything fresh occurs, and rely upon my assistance if it should be needed. At half-past twelve we found ourselves upon the steps of Mrs. Warrens housea high, thin, yellow-brick edifice in Great Orme Street, a narrow thoroughfare at the northeast side of the British Museum. Standing as it does near the corner of the street, it commands a view down Howe Street, with its more pretentious  houses. Holmes pointed with a chuckle to one of these, a row of residential flats, which projected so that they could not fail to catch the eye. It was an excellent hiding-place which she had arranged. The mirror was so placed that, seated in the dark, we could very plainly see the door opposite. We had hardly settled down in it, and Mrs. Warren left us, when a distant tinkle announced that our mysterious neighbour had rung. Presently the landlady appeared with the tray, laid it down upon a chair beside the closed door, and then, treading heavily, departed. Crouching together in the angle of the door, we kept our eyes fixed upon the mirror. Suddenly, as the landladys footsteps died away, there was the creak of a turning key, the handle revolved, and two thin hands darted out and lifted the tray from the chair. An instant later it was hurriedly replaced, and I caught a glimpse of a dark, beautiful, horrified face glaring at the narrow opening of the box-room. Then the door crashed to, the key turned once more, and all was silence. Holmes twitched my sleeve, and together we stole down the stair. When we returned to Mrs. Warrens rooms, the gloom of a London winter evening had thickened into one gray curtain, a dead monotone of colour, broken only by the sharp yellow squares of the windows and the blurred haloes of the gas-lamps. As we peered from the darkened sitting-room of the lodging-house, one more dim light glimmered high up through the obscurity. Again we saw the dim silhouette of a crouching man and the whisk of the small flame across the window as the signals were renewed. They came more rapidly than beforeso rapid that it was hard to follow them. As we walked rapidly down Howe Street I glanced back at the building which we had left. There, dimly outlined at the top window, I could see the shadow of a head, a womans head, gazing tensely, rigidly, out into the night, waiting with breathless suspense for the renewal of that interrupted message. 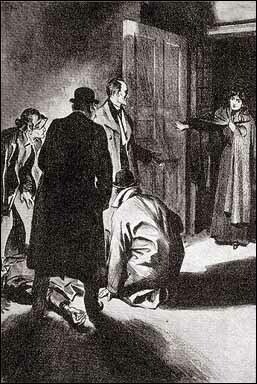 At the doorway of the Howe Street flats a man, muffled in a cravat and greatcoat, was leaning against the railing. He started as the hall-light fell upon our faces. Hes on to us! he cried. The door of the left-hand flat upon the third landing was standing ajar. Gregson pushed it open. Within all was absolute silence and darkness. I struck a match and lit the detectives lantern. As I did so, and as the flicker steadied into a flame, we all gave a gasp of surprise. On the deal boards of the carpetless floor there was outlined a fresh track of blood. The red steps pointed towards us and led away from an inner room, the door of which was closed. Gregson flung it open and held his light full blaze in front of him, while we all peered eagerly over his shoulders. We all turned round at the words. 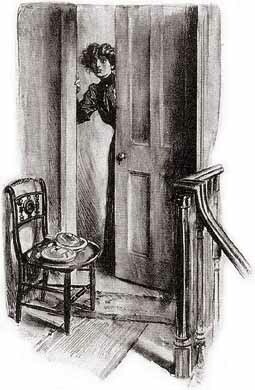 There, framed in the doorway, was a tall and beautiful womanthe mysterious lodger of Bloomsbury. Slowly she advanced, her face pale and drawn with a frightful apprehension, her eyes fixed and staring, her terrified gaze riveted upon the dark figure on the floor. You have killed him! she muttered. Oh, Dio mio, you have killed him! Then I heard a sudden sharp intake of her breath, and she sprang into the air with a cry of joy. Round and round the room she danced, her hands clapping, her dark eyes gleaming with delighted wonder, and a thousand pretty Italian exclamations pouring from her lips. It was terrible and amazing to see such a woman so convulsed with joy at such a sight. Suddenly she stopped and gazed at us all with a questioning stare. 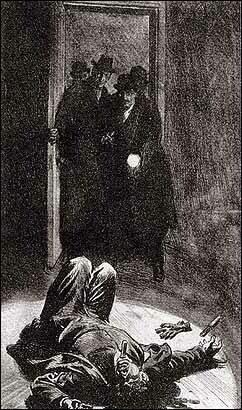 It was I who called, said Holmes. Half an hour later we were seated, all four, in the small sitting-room of Signora Lucca, listening to her remarkable narrative of those sinister events, the ending of which we had chanced to witness. She spoke in rapid and fluent but very  unconventional English, which, for the sake of clearness, I will make grammatical. I was born in Posilippo, near Naples, said she, and was the daughter of Augusto Barelli, who was the chief lawyer and once the deputy of that part. Gennaro was in my fathers employment, and I came to love him, as any woman must. He had neither money nor positionnothing but his beauty and strength and energyso my father forbade the match. We fled together, were married at Bari, and sold my jewels to gain the money which would take us to America. This was four years ago, and we have been in New York ever since. Fortune was very good to us at first. Gennaro was able to do a service to an Italian gentlemanhe saved him from some ruffians in the place called the Bowery, and so made a powerful friend. His name was Tito Castalotte, and he was the senior partner of the great firm of Castalotte and Zamba, who are the chief fruit importers of New York. Signor Zamba is an invalid, and our new friend Castalotte has all power within the firm, which employs more than three hundred men. He took my husband into his employment, made him head of a department, and showed his good-will towards him in every way. Signor Castalotte was a bachelor, and I believe that he felt as if Gennaro was his son, and both my husband and I loved him as if he were our father. We had taken and furnished a little house in Brooklyn, and our whole future seemed assured when that black cloud appeared which was soon to overspread our sky. One night, when Gennaro returned from his work, he brought a fellow-countryman back with him. His name was Gorgiano, and he had come also from Posilippo. He was a huge man, as you can testify, for you have looked upon his corpse. Not only was his body that of a giant but everything about him was grotesque, gigantic, and terrifying. His voice was like thunder in our little house. There was scarce room for the whirl of his great arms as he talked. His thoughts, his emotions, his passions, all were exaggerated and monstrous. He talked, or rather roared, with such energy that others could but sit and listen, cowed with the mighty stream of words. His eyes blazed at you and held you at his mercy. He was a terrible and wonderful man. I thank God that he is dead! He came again and again. Yet I was aware that Gennaro was no more happy than I was in his presence. My poor husband would sit pale and listless, listening to the endless raving upon politics and upon social questions which made up our visitors conversation. Gennaro said nothing, but I, who knew him so well, could read in his face some emotion which I had never seen there before. At first I thought that it was dislike. And then, gradually, I understood that it was more than dislike. It was feara deep, secret, shrinking fear. That nightthe night that I read his terrorI put my arms round him and I implored him by his love for me and by all that he held dear to hold nothing from me, and to tell me why this huge man overshadowed him so. He told me, and my own heart grew cold as ice as I listened. My poor Gennaro, in his wild and fiery days, when all the world seemed against him and his mind was driven half mad by the injustices of life, had joined a Neapolitan society, the Red Circle, which was allied to the old Carbonari. The oaths and secrets of this brotherhood were frightful, but once within its rule no escape was possible. When we had fled to America Gennaro thought that he had cast it all off forever. What was his horror one evening to meet in the streets the very man who had initiated him in Naples, the giant Gorgiano, a man who had earned the name of Death in the south of Italy, for he was red to the elbow in murder! He had come to New  York to avoid the Italian police, and he had already planted a branch of this dreadful society in his new home. All this Gennaro told me and showed me a summons which he had received that very day, a Red Circle drawn upon the head of it telling him that a lodge would be held upon a certain date, and that his presence at it was required and ordered. That was bad enough, but worse was to come. I had noticed for some time that when Gorgiano came to us, as he constantly did, in the evening, he spoke much to me; and even when his words were to my husband those terrible, glaring, wild-beast eyes of his were always turned upon me. One night his secret came out. I had awakened what he called love within himthe love of a brute a savage. Gennaro had not yet returned when he came. He pushed his way in, seized me in his mighty arms, hugged me in his bears embrace, covered me with kisses, and implored me to come away with him. I was struggling and screaming when Gennaro entered and attacked him. He struck Gennaro senseless and fled from the house which he was never more to enter. It was a deadly enemy that we made that night. A few days later came the meeting. Gennaro returned from it with a face which told me that something dreadful had occurred. It was worse than we could have imagined possible. The funds of the society were raised by blackmailing rich Italians and threatening them with violence should they refuse the money. It seems that Castalotte, our dear friend and benefactor, had been approached. He had refused to yield to threats, and he had handed the notices to the police. It was resolved now that such an example should be made of him as would prevent any other victim from rebelling. At the meeting it was arranged that he and his house should be blown up with dynamite. There was a drawing of lots as to who should carry out the deed. Gennaro saw our enemys cruel face smiling at him as he dipped his hand in the bag. No doubt it had been prearranged in some fashion, for it was the fatal disc with the Red Circle upon it, the mandate for murder, which lay upon his palm. He was to kill his best friend, or he was to expose himself and me to the vengeance of his comrades. It was part of their fiendish system to punish those whom they feared or hated by injuring not only their own persons but those whom they loved, and it was the knowledge of this which hung as a terror over my poor Gennaros head and drove him nearly crazy with apprehension. All that night we sat together, our arms round each other, each strengthening each for the troubles that lay before us. The very next evening had been fixed for the attempt. 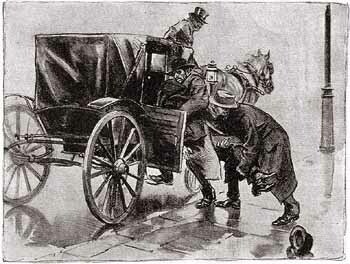 By midday my husband and I were on our way to London, but not before he had given our benefactor full warning of his danger, and had also left such information for the police as would safeguard his life for the future.